1) Simply put the coupon code MARCHBOGOSTAMP in the message to seller at checkout at my Etsy Stamp Shop or ArtFire Shop. 2) Also, please put the name of your top two or three choices for your free stamp in the message to seller at checkout. Some of my stamps are in very limited supplies right now with only one or two left of select designs. I can not guarantee your top choice for your free stamp so please put an alternate choice or two in case your top choice is not available. FYI: Once my stamps are gone, I have decided not to remake them for a while to focus on fiber art endeavors instead. Therefore, if you are interested in any of them, I highly recommend that you purchase the stamp(s) as soon as possible because it may not be available again. 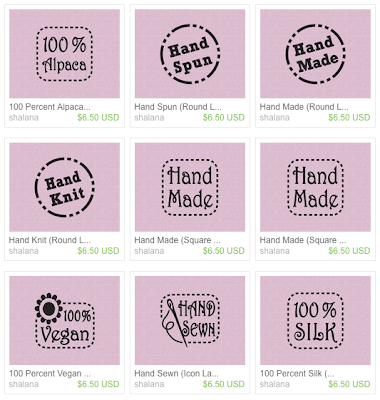 My popular sheep, yarn, hand spun, and hand knit stamps are in very limited quantities! You must use the coupon code MARCHBOGOSTAMP and include your free stamp choices at checkout or in a message to me shortly after to receive your BOGO stamp so please don't forget it!!!! !